IBM joins in the celebration of National Apprenticeship week in the US this November 12-18. This week also marks the first anniversary of the IBM Apprenticeship Program! In the last year, IBM’s Apprenticeship Program has welcomed more than 170 apprentices coast-to-coast, creating new pathways to employment for candidates without an advanced degree. These New Collar career paths are in fields such as software engineering, design, data science, and cybersecurity—critical fields where many companies, IBM included, need to hire great talent! Apprenticeship is an “earn-while-you-learn” experience – typically lasting twelve months in length, and includes hands-on experience, mentorship, and more than 200 hours of learning. 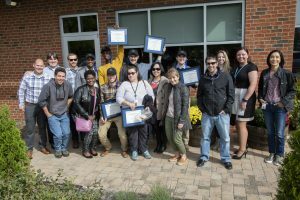 Graduates of the apprentice program receive industry-recognized credentials and digital badges, showcasing the skills gained throughout the apprenticeship. Our apprentices come from all walks of life – students, veterans, career reinventors. When we look for new apprentices, we’re looking for a growth mindset, strong teamwork, and a desire to continue to grow, learn and stretch yourself. Sound like you? Check out the link below and think about applying! In celebration of the program, we’ll be sharing stories from some of our IBM apprentices and managers throughout the week, so check back every day to learn more about the various apprentice roles and to get hints and tips about how you could join us as an apprentice. Want to learn more about the different roles offered? Visit the IBM New Collar Apprenticeship site. Interested in future apprentice opportunities at IBM? Join our Talent Network. Kelli Jordan is the Talent Leader for IBM’s New Collar Program, and leads the IBM Apprenticeship Program.